The sleek Pininfarina-styled coupe version of the 406 was a classic the minute it was launched, and has gobbled far more column inches than the workaday saloon car on which it was based. But what of the standard 406? Twenty-three years since it made its debut, is Peugeot’s fleet, family and minicab favourite a car that deserves consideration as a classic in its own right? After all, it was a car on which much praise was heaped when it made its debut in 1995, thanks to its sharp, angular looks, great handling, supple ride and smartly presented cabin. In the eyes of many, it was the last truly great Peugeot, with many commentators saying that the brand lost its way a bit as the 1990s gave way to the new millennium. That’s a debate for a different day, but what’s not up for discussion is the fact that the 406 was a great car in its heyday. 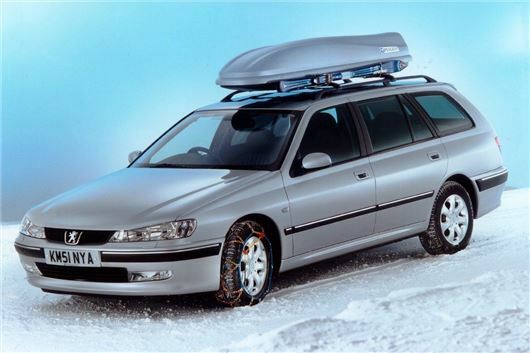 It was launched almost concurrently with the Vauxhall Vectra, and while the Peugeot lacked the option of a hatchback, it was a uniformly better car – much nicer to drive, more refined, more spacious and – as an estate – truly cavernous at the business end. It was even offered as a seven-seater, while a range of tried and tested power units might not have been the first word in modern tech, but they did the job just fine. Okay, so some of the interior plastics were a bit shiny and the gear change on manual models was hardly inspiring, but the 406 was a pleasant car to drive, with a great chassis and superb ride comfort – indeed, it even threatened the benchmark set by the Ford Mondeo launched two years previously, as the handling was sharp yet the ride quality better. For the more upmarket buyer, there was even a V6 and if you chose that, with its ruched leather seats and delicate wood trim, you could almost forget you were in a Peugeot, though the fuel economy and purchase price would have a similar effect. You’d have been brought back to earth with a hell of a bump when the depreciation kicked in, though, so it’s hardly surprising that 406 V6s, delightful as they are, are rare beasts today. Despite being one of the best cars in its class, the fleet sector was big business in the late 1990s and early 2000s, so with a new Mondeo on the horizon and the likes of the VW Passat and Rover 75 eating into the 406’s four-door heartland, a facelifted model came along in 2000. Luckily, Peugeot didn’t mess around too much with the looks, and while the later 406s weren’t as simply styled as the original models, which had a definite hint of 405 about them, it was at least sensible enough to not over-style the front end or try and introduce the wide-mouthed frog look that would usher in the next generation of the company’s cars. New, more refined diesels came in, too, although the ‘HDi’ units weren’t as revered by dieselheads as the old, rough but utterly indestructible XUD power plants. Like all big saloons, the 406 was popular for a while before falling into the second-hand car ghetto, from which only the strongest have emerged alive. Thanks to the space and comfort on offer, not to mention the reliability of the diesel engines, many a 406 finished its journey with a taxi light on the roof, while others just became cheap family cars, run on a shoestring and considered disposable. And that’s where many of them remain – from a peak of quarter of a million 406s on the UK’s roads in 2003, there are less than 17,000 still taxed – less than a third of the numbers that survived three years ago. It won’t be long at all before 406s become a very rare sight indeed, and the coupes will, ironically, outnumber the saloons and estates. With rarity, then, will the 406 ever become collectable? Well, in a monetary sense, probably not – you won’t be stashing one in a lock-up as your retirement fund. But as an example of a great family car from its era, a good 406 is something that deserves to be bought, cherished and preserved as an inexpensive modern classic that – one day soon – will be a very rare car indeed. Great motors. I never had one but drove a few. At the time I had several 306's followed by a couple of estate variants. These were more than large enough for a small family at the time. Wind the clock back a few years and an older family, the 406 estate would have been top of the list. Ok they don't have the Kudos of a German motor, but they were extremely reliable, frugal in diesel form, comfortable and highly practical as an estate. I would say our current Superb estate is a very close modern interpretation. I have no complaints with that one either. Quite a number of years ago I passed on our old 306 HDi estate to father. He is still running around in it today. Brilliant car. I had a 1997 406 2.0 GLX which was completely a great drive and completely reliable, in marked contrast to its 405 predecessor. Unfortunately, I killed it by driving 120 miles in a heatwave, then parking on dry grass. Exhaust set grass alight, then grass set engine bay alight: end of 406.